My engine check light has come on? Over the years of working with Morgans and supplying our ECU chips for them we have had a couple of customers that have had an issue. However we have always got to the bottom of the problem and the result has always been another happy customer. Along with the two points below the engine check light can come on due to a sensor fault, this fault may not have been present with the original ECU chips installed because the original ECU chips do not scan the sensors as frequently as our chips do. Therefore our chips are more sensitive to faults with sensors as we are more reliant upon there information. We have found that there could be two reasons for the engine ECU logging this fault. The first and most common issue with this model of Morgan is a simple wiring fault. This fault means that the wire going to the engine check light is in amongst all of the other dash board wires. This wire is joined to the wire that carries the signal from the Lucas Alarm system to the Sagem ECU. When you first switch your ignition on the alarm code is sent down this wire, however at the same time all of your instruments on the dash board are powered up causing a large power surge (and magnetic field) around this bunch of wires. As the alarm code is only a very small signal it gets interrupt/corrupted by this power surge and therefore the ECU logs the above fault. To cure this it is necessary to remove the signal wire that goes to the engine check light from the mail loom. 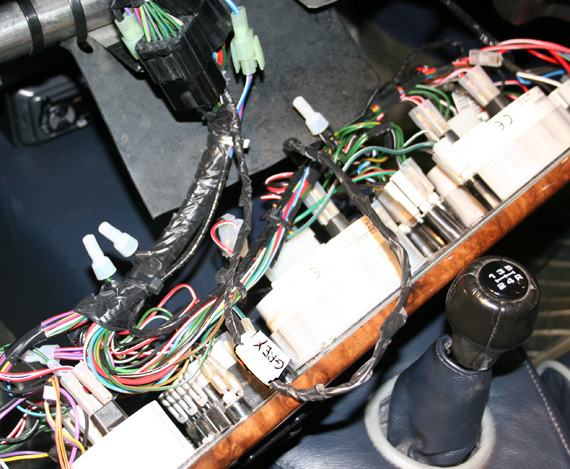 On the model that we photoed below this wire was grey in colour and we only had to remove it from the dash board loom and run it separately to the multi plug. Secondly we have found that the Lucas 10AS Alarm ECU can be faulty. It is not as common as the above fault however is not something to over look. Normally you can tell if the ECU is working correctly or not by reading and writing the settings to it with FaultMate or testbook. A faulty ECU will normally not allow this function to happen. We have only seen this fault twice to date however it is still worth mentioning. On two Morgans we have seen that the ECU has not shut down properly and therefore causes over time if the vehicle stands the battery to go flat. After a long investigation period we found that the ignition switch was not giving a nice clean break of power to the ECU. This is easily fixed by installing a relay on the power supply feed to the Sagem ECU that is triggered by the ignition switch. The relay supply will give a much better ON to OFF signal and this is how both of the cars have been fixed.